Can you define what it means to “Be Orange”? 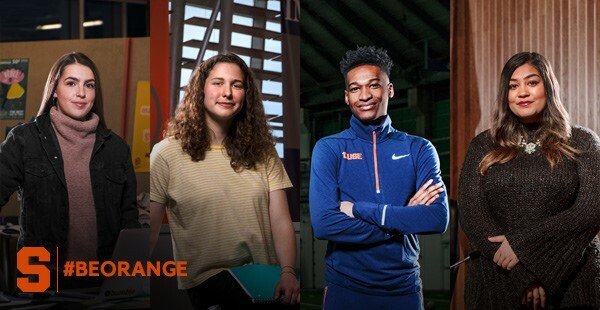 A new marketing campaign will provide compelling glimpses into the Syracuse University student experience and encourage the entire Orange family to share what the University means to them. As part of the new campaign, the University has introduced a new 30-second television commercial that highlights student learning, research and SU spirit. The ad made its national debut Friday evening during the Syracuse vs. Western Michigan football game on the CBS Sports Network. Other components of the campaign include print ads, digital ads and social media promotion, all using the #BeOrange hashtag. Members of the Syracuse community—students, faculty, staff, alumni and friends—are invited to share what it means to them to #BeOrange on social media. Whether highlighting what they love about the Orange and Syracuse University, giving a shout-out to their Orange family and friends, or sharing a story about someone who helped them learn, grow and find their path—#BeOrange is a way to stay connected. The campaign also highlights the stories of students from a variety of schools and colleges with diverse experiences. Developed by the Division of Marketing and Communications, the campaign is being launched to introduce Syracuse University to prospective students and their families. For those already part of the Orange family, the campaign provides a platform to share pride in the Orange, the distinctiveness of the people and campus, and the connections that unite all those who bleed Orange. Members of the Division of Marketing and Communications used quantitative research and tested the campaign with student focus groups to select a concept, messaging and imagery. The campaign is the first of its kind in recent history for the University in telling the broader Syracuse University story, with a focus on student experiences and engaging with the SU community, on campus and around the globe. What does #BeOrange mean to you? Visit the University’s social media pages on Facebook, Twitter and Instagram to join in and share with other members of the SU community.